In the Patrick Bowers Files novels, FBI Special Agent Patrick Bowers has stopped some of the most vicious serial killers ever imagined. Now, in the latest installment, author Steven James takes readers back to Bower’s terrifying beginning. Six novels. That is how many the Patrick Bowers Files now contains with the release of Opening Moves—a prequel that takes readers back to Bowers’ days as a homicide detective in Milwaukee, Wisconsin. It is quite hard to have so many books in a series and keep your readers engaged through all of them, and yet, Steven James has done that. With this installment, he shows his readers that he has much more up his sleeve. The twists and turns that the story takes are not things that readers will not easily forget. It is intense, jarring, and gripping. It was impossible to be bored while reading it. One of the things that I found most enjoyable about the book is the way that Steven wrote Patrick and introduced his tendencies that we have come to love in the previous books, such as his opting for a mini Maglite flashlight. It was fun to see how Patrick came to be the way we have known him as. The character relationships are a great plus to the book as well. Readers will smile and laugh as they see how Patrick met certain characters and how their relationship first started out. I must give a warning to readers: Opening Moves is a terrifying novel. Steven says in the note in the front of the book, “I had nightmares writing this book.” It is quite easy to see why this is. The book is not for the timid. In fact, Opening Moves is more disturbing than the previous books in the series—not because the violence is amped up, but because it focuses a lot on real killers in our nation’s history. Evil is real, everyone, and Steven does not shy away from that fact. If a reader has not read the other books in the series, no worries. Steven said that new readers should start with this one; but I have to say that reading the series in published order isn’t that bad of an idea either. 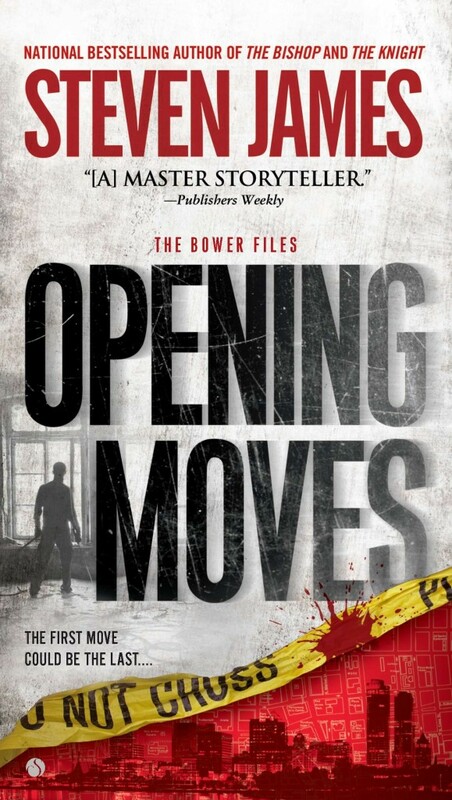 I am happy to say that Opening Moves has earned the spot as my favorite Patrick Bowers Files novel, and a spot on my top ten crime novels.